Solo Lisa Reads: Finding Myself in Fashion by Jeanne Beker--Plus Giveaway! Host of Fashion Television, editor, clothing line creative director, author, trained actress and mime, mother...is there anything that the indomitable Jeanne Beker can't do? In her new autobiography Finding Myself in Fashion, Beker opens up about her personal and professional life in an unprecedented way. Engaging and articulate, this book recounts her encounters with some of fashion's biggest names and candidly discusses the ups and downs in Beker's personal life. Finding Myself in Fashion is structured as a series of non-sequential vignettes, each chapter plunging the reader into a new time, place and subject. I had trouble following along at first, but eventually I settled into the narrative groove and went along for the ride. And what a ride it is. After 25 years as host of FT, she has seen it all: Valentino and Yves Saint Laurent's retirement, Alexander McQueen and Isabella Blow's suicides, 9/11 and the resultant cancellation of New York Fashion Week. 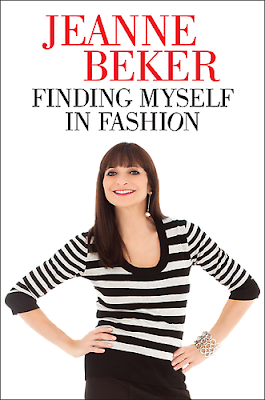 Beker does a great job of capturing the allure, charisma and creative genius of the fashion designers that she covers. It's obvious that she never ceases to find them inspiring, which in turn inspired me to admire them even more. Interspersed with stories of the upper echelon of the fashion world are accounts of Beker's own life: how her parents survived the Holocaust; her painful divorce and romantic misadventures; her two girls, Bekky and Joey; how she found her idyllic country home; and so on. Finding Myself in Fashion ends with Beker touring across the country to promote her EDIT clothing line, during which I had a chance to meet her. But even as I finished the last paragraph and turned the page, I got the sense that although the story ends there, the next great chapter of this amazing woman's life has yet to begin. Special thanks to Penguin Books for sending me an advance copy of the book to review. Finding Myself in Fashion is available in bookstores nationwide, but one lucky Solo Lisa reader can win a copy of their own! For a chance to win, simply leave a comment on this post telling me what your favourite Jeanne Beker memory is. (Did you grow up watching FT and fantasizing about interviewing Karl Lagerfeld? Did you enjoy watching her as a judge on Canada's Next Top Model? Did you read her Globe & Mail columns in the Style section religiously?) If you don't have a blog or Twitter, leave your email address so I can contact you. All entries without a means of contact are disqualified. The contest ends Friday May 20th, 12pm Pacific time. The winner will be chosen randomly. Good luck! I lived in Hungary for a few months after I finished University.... oh about 20 years ago. In my little apartment, that I shared with 3 other International students, we got only one English channel. Which was mostly news - except for Fashion TV. It was like a little piece of home. nice review, I read the first chapter of the book but planning to eventally finish it, she has been through so much and her life story is so interesting! I'll have to read this. I loved her on TV back in the day. I think my favourite memory of Jeanne Beker was hearing her talk at the Bay last October and getting a chance to meet her. For someone who has seen so much she is so grounded. It was her motto "Don't be afraid and never give up" that stuck with me. Although I am relatively new to understanding the fashion industry, courtesy youtube and my fervor for researching, beyond the designers, the first corresponding professional I learned of was Jeanne Beker. I honour her tremendously. From establishing her name as, I find, the most recognized and pronounced Canadian fashion corespondent to befriending the darkest and most romantic fashion designers of our time, Alexander McQueen. There is so much to learn and to celebrate from the work that she traces back to her Canadian roots, it would be an honour to learn of her momentous career that shows no sign of stopping. Has made a name for herself - a history I would definitely like to devour! And of course, I loved her on CNTM as there's no fashion in Canada without Jeanne Beker!